By now the fact we like to share our experiences with older vintages of NC Wine should come as no surprise to anyone. Whenever a winery is advertising a special library tasting or a vertical event, we try our hardest to attend. 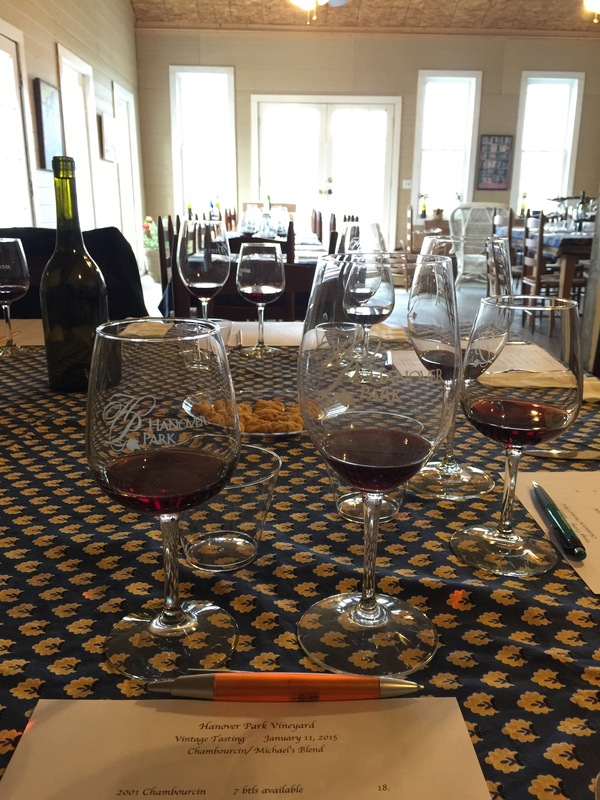 Most recently we had an opportunity to attend a special library tasting at Junius Lindsay Vineyards. Owner Michael Zimmerman has decided to share some of his library collection of past vintages. When we saw the announcement that his first library tasting would be his Triomphe blend, we jumped on the chance to reserve our spots. Ah! 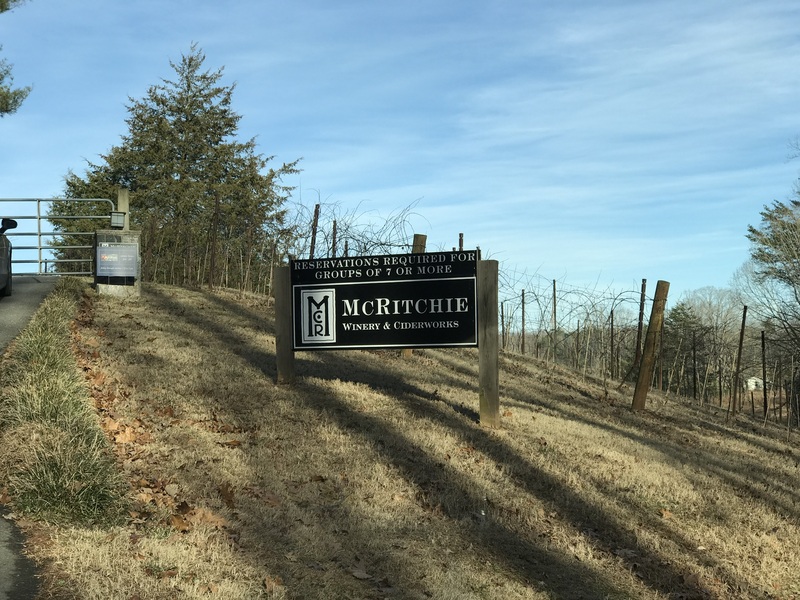 McRitchie Winery‘s Ring of Fire, a highly regarded red blend in the North Carolina wine world. Some have called it North Carolina’s Octogon. Octogon is the highly acclaimed red blend from Virgina’s Barboursville Vineyards. We’re certainly not going to disagree with that assessment. Ring of Fire is consistently a great wine. And, that name, an homage to the classic song by Johnny Cash, makes for a memorable wine too. Although, the wine itself doesn’t burn, burn, burn. Well, perhaps, it does burn a memory. A memory of the first North Carolina wine that captured my attention near the time of the first vintage which was in 2006. It’s since become a favorite of Matt’s too. 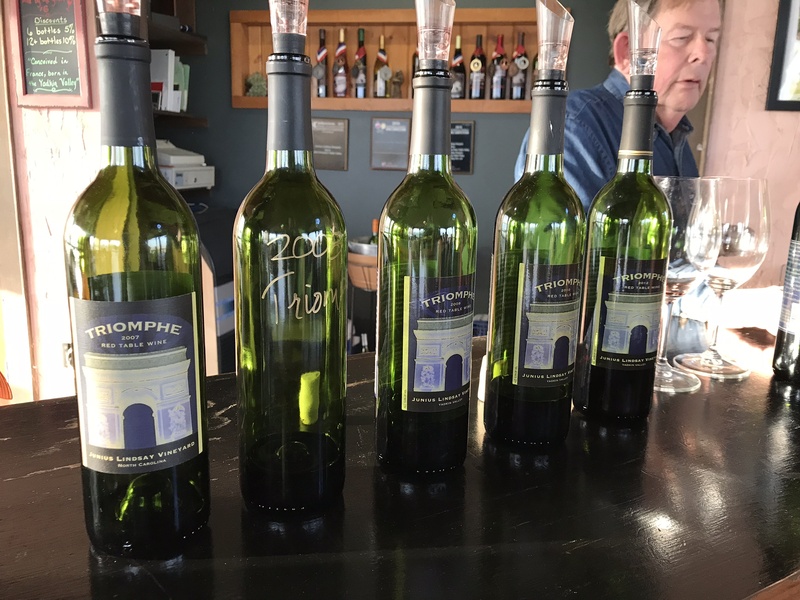 So, when we heard that Sean and Patricia McRitchie were planning a vertical tasting as part of their winery’s 10th Anniversary, we just couldn’t miss it! The tasting was limited to about 25 or so people. We were seated at tables throughout the tasting room. The tables were beautifully set. The first wines poured were the 2013, 2012, and 2011. Before we began tasting, Sean and Patricia welcomed us. Now, it was time to taste! We began with the 2013 and worked our way backwards. The first round allowed us to taste the 2013, 2012, and 2011. Each was served in a different glass. Later, we were served the 2010, 2009, and 2008. To continue the similarities with Octogon from Barboursville, Ring of Fire is also predominately Merlot and Cabernet Franc with a bit of Petit Verdot. Only two vintages differ. The 2012 is Merlot, Sangiovese, and Petit Verdot. The 2011 is Merlot, Syrah, and Petit Verdot. In addition to the wine, food was served. Some items were intended to pair with the wine. Other items were there to prove a point that some food and wine pairings just don’t work. The first plate consisted of apricots topped with blue cheese, a pecan, and rosemary along with a skewer of tortellini tossed in pesto with artichoke, mozzarella, and basil. The second plate consisted of meatballs made with Ring of Fire, BBQ sandwiches with a mustard sauce and a more traditional sauce along with a few shrimp. Our favorites were the apricots and the BBQ. 2013 – The nose was woody with nice cherry aromas. The palate presented rich cherry and oak with smooth tannins. This wine is still very young. 2012 – An earthy yet softly floral nose led to a lush palate of cherry and oak. We preferred this one over the 2013. 2011 – A floral nose with notes of plum and dried herbs made way to a tannic palate of dark fruits, cedar, and vanilla. The tannins of this vintage surprised us. 2010 – Very old world in style, the nose had notes of spice with dark cherry. The palate gave us dried berries with soft tannins. This was our favorite of the lineup. 2009 – Spice and oak on the nose along with cherry and vanilla on the palate, this vintage really showed the Merlot. There was also good acid. The boldness of this vintage surprised us. 2008 – Sean hinted that one vintage was different. When we got to the 2008, we knew it was this one. The nose was floral and woody with a hint of sawdust. The palate was wild with dark fruits. There was something off. We suspected brettanomoyces. Following our tasting, Sean and Patricia spoke once more. Sean mentioned that blending is a way to deal with the difficult North Carolina weather. It allows you to control the winemaking a bit and make adjustments as necessary. His winemaking style is that of experiences. He thinks of what will pair with the wine. The desire with Ring of Fire is pair it with a steak from a Chicago steakhouse. Given that, Ring of Fire has more acid than a red blend from Napa making it better accompaniment with food. 2013 – This vintage is fresh with the most straight forward fruit. It will age very well. 2012 – Sean’s second favorite of the group, this vintage has notes of clay and earth. It reminds him of a terra cotta pot. 2011 – He found this vintage to have aggressive spice with notes of fresh flower. Complex and young with good berry and tannins, he feels this wine will be better in three or more years. 2010 – Sean’s number one standout features red fruits and light earth. Other descriptors are wet clay and stone. The tannins are balanced. This is very old world like. 2009 – Patricia’s favorite features bright fruits with tighter acid and tannins. It’s still excellent. 2008 – This wine still looks young with dark berry color. Cherry and anise are on the nose, but the wine is faulted. Brettanomyces is indeed the issue, but we had several folks who loved it. After this vintage, Sean purchased an ozone machine to clean barrels in the winery to prevent brett in future vintages. Sean then finished with a few more remarks. He gave a preview of the 2014 Ring of Fire which has been bottled and will be released soon. He says, “I like that a lot.” It meets the Chicago steakhouse criteria. Sean purchases fruit by taste rather than brix. 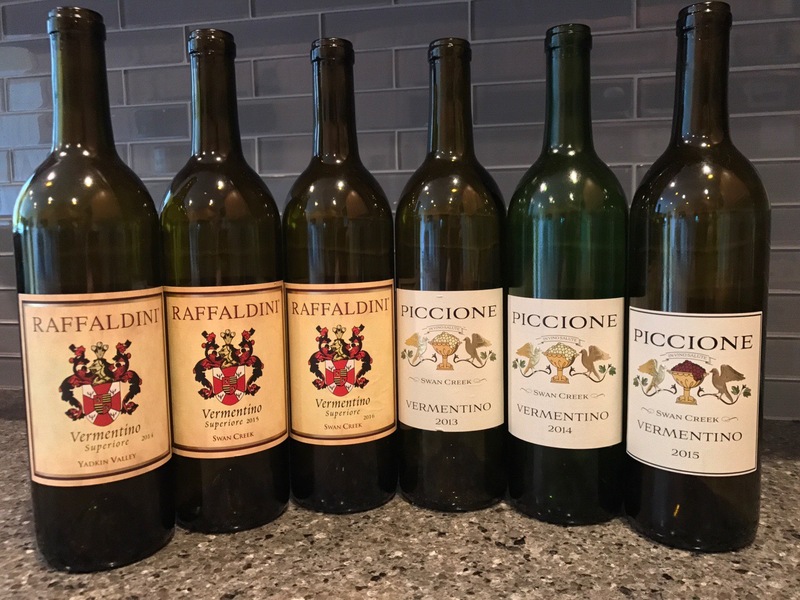 He added that he was pleased with the consistency of the each vintage of Ring of Fire and notes, “I feel like I passed.” He’s pleasantly surprised how well he liked the lineup. We agree! Sean also mentioned that Patricia makes him keep a library of wines. We thank her for that. They also mentioned that reserve sit-down tastings of library wines might be offered soon! Sign us up! We thoroughly enjoyed this experience. We thank Sean and Patricia for all they do for North Carolina Wine and Cider and look forward to the next vertical tasting! Go visit them and see for yourself! 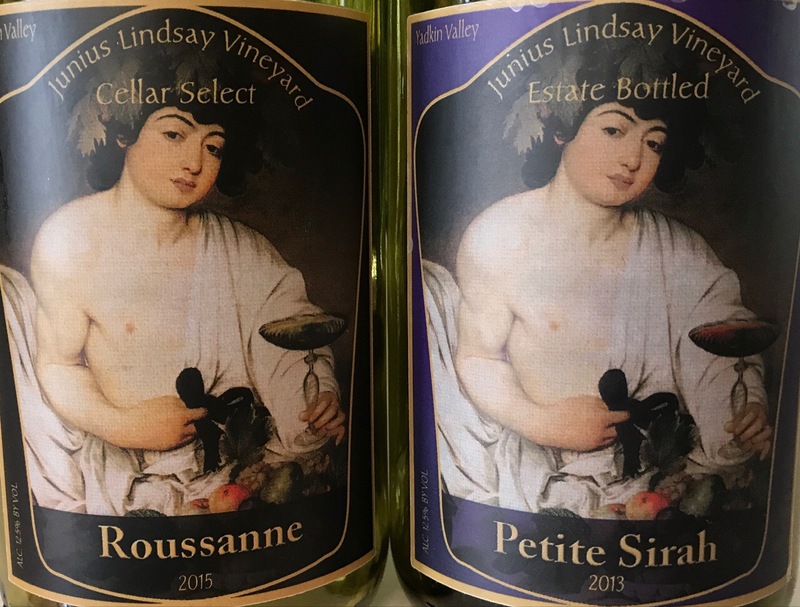 Continuing with our series of bringing lesser known grapes into the spotlight, we take a deeper look at Petit Manseng. This small cluster and small berry grape make a very interesting wine that most people have never heard of. This grape has great potential here in North Carolina and there are already a few vineyards who have jumped on the Petit Manseng bandwagon. 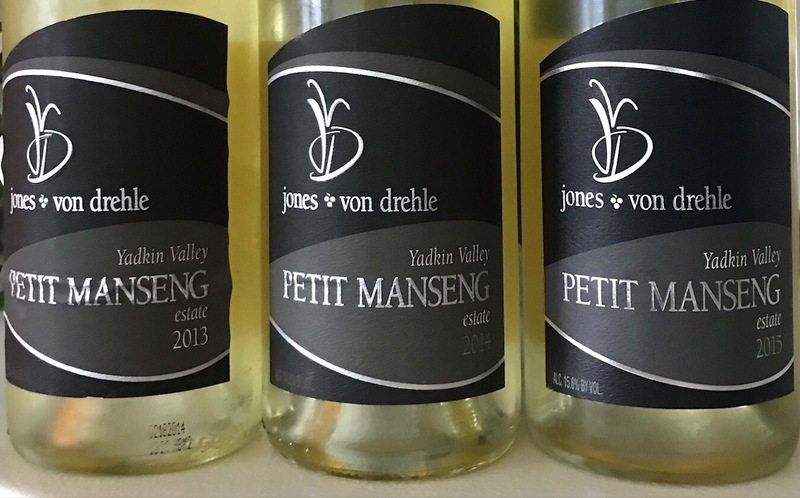 One of which is Jones von Drehle Vineyards & Winery in the Yadkin Valley. Let’s take a minute to talk about two lesser known wine grapes, one red and one white. If you easily get fatigued from Chardonnay and Cabernet Sauvignon, these will be two varietals you need to try. The grapes in the spotlight are Roussanne and Petite Sirah. Both grapes are capable of producing a robust wine that can offer a welcome alternative to the more popular choices.